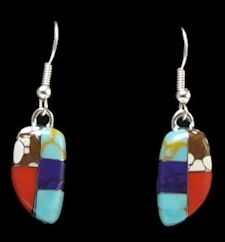 These german silver stone dangle earrings are mounted on hypoallergenic french ear wires. Each earring measures 3/8" wide (.9525 cm) at the widest end by 3/4" long (1.905cm), not counting the ear wires. Hand crafted, 1 pair only! This product was added to our catalog on 09/23/2018.